It’s Chinese New Year this weekend, and while we’d love to brave the crowds at some of our favourite Chinese restaurants, we decided to pick up some ingredients in Chinatown and make a few of our favourite things at home. 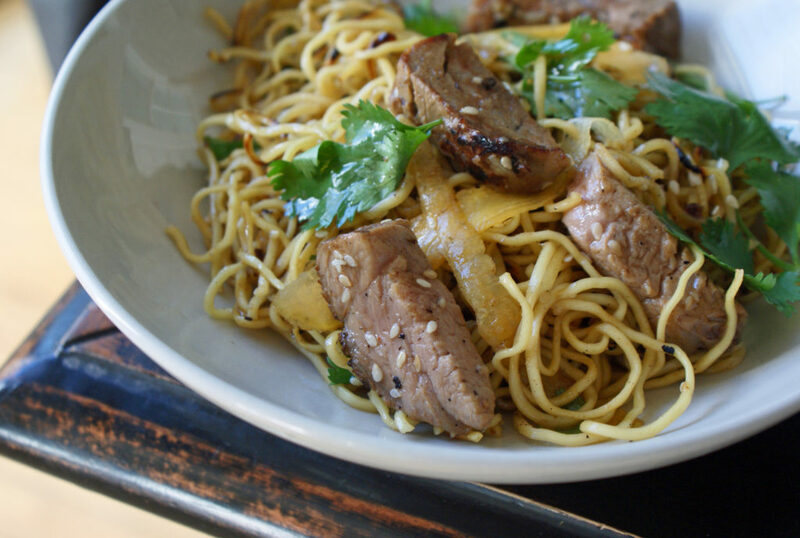 Noodles are always a hit around here – especially quickly fried with a mildly spicy sesame sauce and tender pork tenderloin. This is an easy dish – I used some leftover roasted pork tenderloin, but you could easily substitute shredded roasted chicken or cooked ground pork, or sautéed shrimp – or just add more veggies! In a large skillet heat the canola oil and sauté the garlic and ginger for a few minutes, until soft but not brown. Transfer to a bowl and add the sesame oil, soy sauce, vinegar, honey and chili sauce. Meanwhile, cook the noodles according to the package directions, or until tender. Drain them well in a colander. When the pan is empty, add a little more oil and toss the noodles in the pan, letting them sit for a bit to get nice and brown, then tossing them around. Add the pork and sauce, and toss to coat and heat through. Posted in Recipes, Beef, Pork & Lamb and tagged Pork, noodles.